The World Cup begins only a few days left. In this time the tension of the tournament blow in the air. Every participant dreaming to win the Russia championship so far. 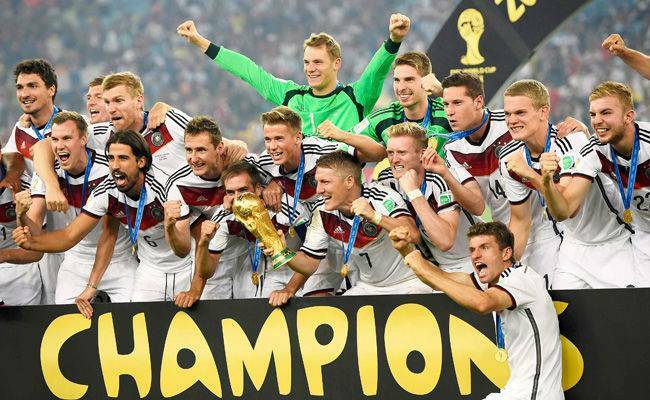 But this time the World Cup will be bagged by the defending champion Germany. The popular Football Website released a report on the 2018 WC in Russia. They survey among the participant and it shows that Germany will take the WC trophy this season. According to them, they make online voting based on players, team country etc. And it is known from the fact that about 345,55,363 visitors participated in their voting curriculum. They parted by online so far. Though there are doubts about this voting point, football watchers are investigating it. Because the German was not favorite in 2014 Brazil WC, but at the end of the tournament the bagged the trophy and became the winner of the title for four times. And there are many people who believe Germany being the most favorite of the competition. Their ideas the team will take trophy. Whatever happened in the main event it’s really tough to say. German players are very confident. They are also desperate to grab the title for five times. In the FIFA ranking they holding the first position and have the record of non defeating in the qualifier round. But last friendly they lost against Brazil. But it make them more serious and they practice more and more to do well in the future. Now let us see how many percent votes were cast the other teams. According to the Web site’s comment a total of 33 million 54365 people voted. The German got 36% and among of them they existing above the top. The five time world champion Brazil got 26% and holding second place. By getting 19% Spain existing in the third position. Although Messi’s Argentina has gained 15% of the vote, which gave them the fifth place. On the other hand, the hosts nation are in the fourth place. That being the total result of the survey. However, this is the result of this list. For that we have to wait a few more days. Who will be the next champion of the trophy. Messi, Neymar, Iniesta, Ronaldo and Mueller who will be crowned by the 2016 World Cup in Russia. But to grab the trophy every team tried their best. And they played more and more friendlies and getting preparation ahead of the tournament.